Sketch Fridays #26 – X-Men: Apocalypse. Click to enlarge. Below is a transcribed and revised version of ideas originally presented in D. Bethel’s podcast, A Podcast [ , ] For All Intents and Purposes, from the episode titled, “Shortcast 13 – So Arch, So Blue.” Listen to that episode for more about the X-Men, Apocalypse (the character depicted above), and thoughts about the X-Men movie franchise (but no comments about the new movie). As the new X-Men film was released to theaters, I embroiled myself in nostalgia for the franchise. I’ve gone back into the archives and read through old stories which were new to me as well as those with which I was already familiar. But what I’m most intrigued by, looking at the X-Men through my adult and career-focused eyes, is the fact the X-Men are not a government team nor a private conglomerate of do-gooders; the fact that they are a product of an educational institution, a superhero team with a pro-intellectual underpinning that stands in bright contrast when compared against the rest of the Marvel universe, allows for such strong and pertinent questions to be prodded and partially answered by the stories in the comics and movies. Captain America, in contrast, is indeed created by science, but done so for the sake of war. Hulk is the literal inversion of logos-based reasoning. Thor is pure space opera and Iron Man is capitalistic masturbation. The X-Men, more than the Avengers or anything from the DC universe, are not above nor below the common public. They are the heroes from within, addressing purely American social problems without even needing the veneer of metaphor if it came down to it. The ultimate question that guides this team of superheroes, by the very nature of their superpowers, is not (like the Avengers) “how can we help those who cannot fend for themselves?” because, for the X-Men, they could save the world from cosmic-level existential threats and still come home to base persecution and hate with no governmental or institutional recourse for such behavior against them. Instead, the question that guides the X-Men is much more relatable: “how do we help those who will not help us?” It’s altruism at its finest because the ideology is about pushing against the current rather than being a symbol for it, which is what, many would argue, is not only the American but the human condition. To me, the X-Men are the heroes of humanity, not for it. They’ve done their job not if they save the world, but if they’ve been considered equals among that which is considered normal and, with hope, adjusts the definition along the way. In the creation of this week’s Sketch Friday––the villain, Apocalypse, who is the titular threat in the new X-Men movie––I tested out Live Streaming technology as I inked the above drawing. I streamed through YouTube and it worked fairly seamlessly. There were connectivity problems, but I think that was on my end as my city strained under the first major heat of the summer. The stream was archived on YouTube, so you can check them out there (and embedded below). Because of the connectivity issues, streaming was stopped for a bit and broken up into two pieces. They aren’t very exciting; there’s a bit of drawing but mostly periods of nothing as I check the screen trying to make sure everything was working well and just get a general comfort with the service. 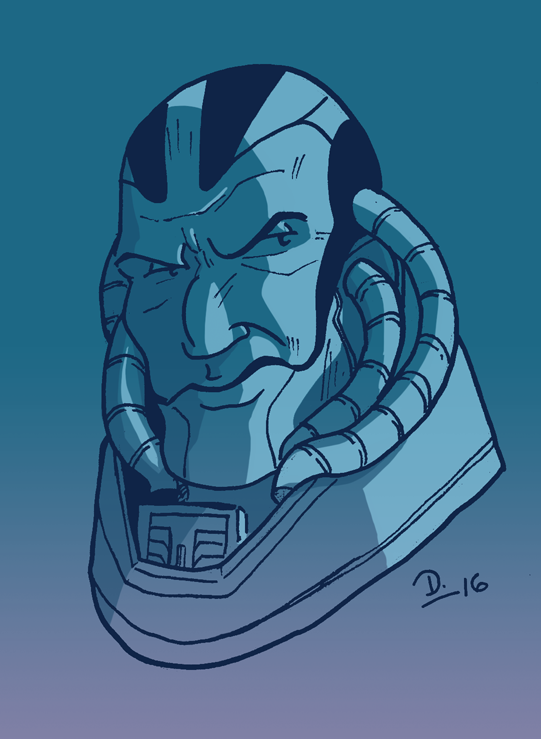 But they’re there for posterity, and if you want to see me draw Apocalypse in wavering bouts of quality, this is your one-stop shop.